Basil, a tender, leafy member of the mint family, is most abundant in the summertime and available at many produce markets year-round. Because it's easy to grow both indoors and out, basil has found its way into many cuisines. You'll appreciate its warm, mild, licorice-tinged flavor and aroma in both hot and cold dishes. Fresh basil is often paired with tomatoes in both hot dishes and cool salads. 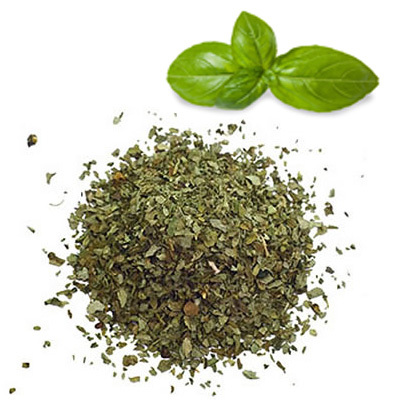 Common basil has large, bright green leaves, while globe basil, a bushier plant, has more, smaller, and spicier leaves. Other varieties include opal or purple basil, a purple or purple-and-green variety with a spicier flavor and slightly tougher leaves. Basil adds a very pleasant slightly sweet flavor. It is used on all tomato dishes, potato soups, spaghetti, venison, duck and sausage making.